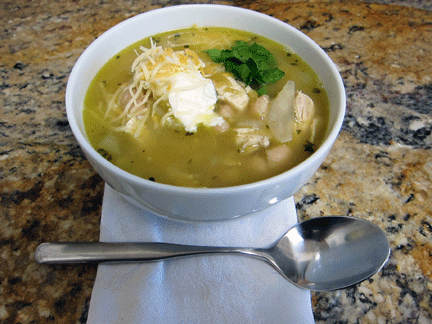 This recipe for a white chicken chili was adapted from one submitted to our local newspaper four or five years ago. A personal chef who favors healthy eating created it and it has become a cold weather staple in our household. I double the stock so it is more like soup than a classic chili and love the low sodium level of the finished chili. It is my favorite for a healthy start to the New Year. 1. Poach the chicken breasts in water with lemon juice. Add squeezed lemon halves to poaching liquid. (This will allow the lemon oil released from the rind to flavor the poaching liquid.) Cook, covered, over low heat for 10-15 minutes. Cut into thickest part of breast to see that meat is no longer pink. Remove and shred when cooled. 2. Heat oil, add onion and cook for five minutes. Add garlic, chiles, cumin, coriander, oregano and cayenne. Stir until blended. 3. Add the beans, stock and shredded chicken. Add the stock and stir. 4. Bring to a boil, then lower heat to simmer 20-30 minutes. (Better reheated). 5. Serve with dollop of low-fat sour cream and/or grated reduced fat cheese. This soup will be on my new grandma list which I’ll be cooking for the new parents once Tassia blesses us with her arrival. It freezes well, Toni, good for in advance prep. Remember, my date I am betting on is 10-19! Thanks, Linda – it is a winter “regular” at our house. Never got any attention on the site, though. Glad you enjoy it! Thanks, Brandon – finally chili weather!